Sadly I know from personal experience how deadly pancreatitis in dogs can be. It can hit fast and furious, so please keep reading to learn what it is, how dogs get it, how to treat it and what you can do to prevent it from happening to your dog. If your dog has lost interest in food and is vomiting, often it’s just a passing thing. He may have picked something up out of the grass outside, or found something on your kitchen floor that seemed like a good idea at the time, but is now making him ill. On the flip side, it could also mean pancreatitis. The pancreas sits behind the stomach and produces and secretes digestive enzymes, essential for food digestion. It also produces insulin, which helps control metabolism and blood-sugar levels. or keep reappearing (chronic). Basically, chronic pancreatitis is multiple attacks of the acute form. What is interesting, and what also makes watching what your dog eat even more important is – even if your dog does not ordinarily eat a high fat diet, just eating a large amount of fatty food in one go can cause acute pancreatitis. Dogs can usually recover from mild cases, but severe cases are more worrisome, and can lead to the death of your dog, as it did to one of mine. Your vet can get a pretty good indication of whether or not there is a possibility of pancreatitis, based on what you tell him about your dog’s condition, and symptoms. He will perform blood tests and urinalysis, and other tests such as ultrasound, x rays… are a possibility. If it is a side effect of medication, your vet will discontinue the medication immediately. Depending on the severity of the attack, all this can be done in a few hours at your vet’s office, then your dog will be able to go home with some medication/electrolytes… (whatever your vet recommends). A clinic/hospital stay of 1-3 days is usually in the cards in severe cases. A low fat, bland diet will be prescribed, the length of time to be determined by your vet, depending on your dog’s condition. It may be just until he recovers, or a permanent move. If you follow a more natural or holistic diet, and the recommended diet is not, voice your concerns, learn what ingredients should be avoided and why. Bring the packaging of the food you prefer, to see if it’s suitable. Your vet may want to repeat some of the initial tests, to monitor recovery and progress. Many cases happen over the holidays, when rich fatty food is in abundance. Be extra vigilant about what your dog is putting in his mouth, and keep an eye on anyone slipping him food. If after repeated warnings no one is listening, put your dog in another room. Better safe than sick. 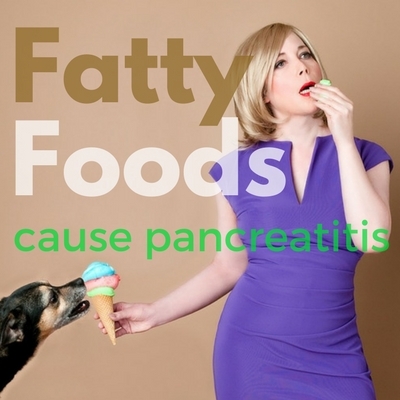 Pancreatitis can be very unpredictable. I’ve known dogs who have had it most of their lives, but a strict diet kept it pretty much under control. 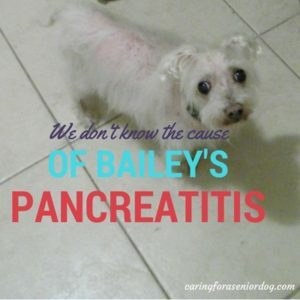 In my dog Bailey’s case I think his death was caused by a combination of factors that created a perfect storm – my amazing vet was away, not thinking it was pancreatitis at the first sign, too many people involved at the clinic I went to, and a seemingly obsessive desire on the part of one vet to euthanize my dog. Bailey was finally treated by my vet, but sadly by the time he got to him, it was too late. He was kept comfortable on fluids for 3 days, but he was never going to recover. Red had a couple of very mild episodes but some fluids and food restrictions and she was fine. Mild cases, or dogs that had a “one off” episode don’t typically require more than a good diet, and diligence on the part of the family. Chronic pancreatitis can lead to other more serious issues, so you want to be very strict in following all recommendations made in your dog’s treatment to avoid going down that very slippery slope. Sometimes your dog being sick is just your dog being sick, and other times it is much more serious. If your dog is vomiting, call your vet’s office immediately. Let them know of your concerns, and be sure to mention anything your dog may have eaten. Pancreatitis can attack fast, and attack hard, so the sooner you start treatment, the better your chances of a positive outcome. What has been your experience with pancreatitis in dogs? Do you know why he got it? What treatment plan was recommended? Has he had other bouts with it? 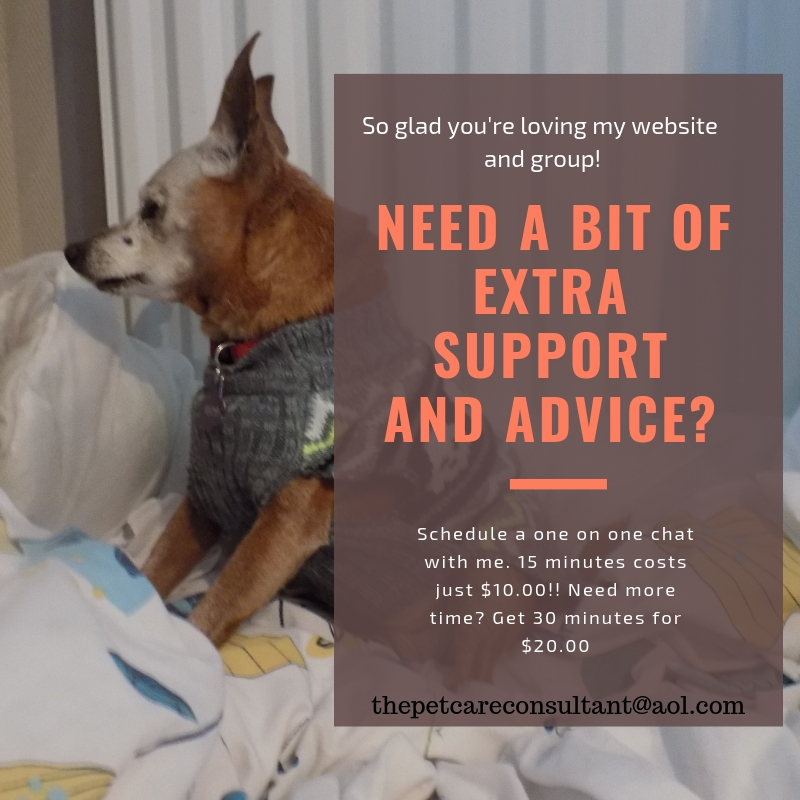 Sharing helps others so please tell your story in the comment section below, or in the case of a senior dog on my Facebook page. My dog has been diagnosed with pancreatitis the ver kept him for two days giving him fluids through IV. He is now home and is still vomiting at least 10 times a day. He has had no food for almost 2 weeks. Maybe a little (one or two bites) will he starve with out food this long? Hi Linda, I imagine you’ve spoken to your vet to let him know what’s been going on. I can’t understand why he hasn’t checked your dog again. That’s a seriously dangerous situation you need to be at your vet’s office tomorrow morning when it opens or at an emergency hospital now. I don’t mean to scare you but he needs medical attention urgently. You’re very fortunate the pancreatitis was caught early and treated so successfully. Oh my goodness, how scary that must have been when he started to bleed. Glad to hear it hasn’t happened again, but did they tell you the reason for it happening? I’m not sure what you’re talking about when you mention blood. If your dog is peeing blood she might have a bladder infection. I would call the vet right away and explain you need to be seen immediately. Hope everything is okay. Recently, my 13.5 year old cross Keplie/Fox terrier developed sever acute pancreatitis and deteriaoted rapidly.Withina day and half of first symptoms – she was barely able to walk, wasn’t able to retain any food or water and lost all energy. The vet advised that treatment was an option but did add that given her age – we need to really weigh it all up. Financially, we were looking at around a $1.5k to $2k vet bill. Treatment at her age would not be a guranteed sucess, considering the severity of her condition and her aging body. In the event of success, she was going to still experience discomfort in the months ahead. At a younger age, treatment would be a no brainer. I’m so sorry to hear that Tom. I can’t imagine why such a huge vet bill though. The vet bill is for Emergency Medicine, i.e. IV fluids, pain meds, antiemetics, boarding. I’m currently going through this process with my 14 year old dachsund. Acute pancreatitis comes on extremely quickly and could be a result of something he ate. Fluids help and I assume your vet recommended a low fat diet for him. Depending on how severe the attack is your dog may be on fluids from 1-3 days. Hope he’s feeling better by now. Fluids do help them feel better, but sadly they don’t always lead to the results we would like. It’s good he’s eating and hopefully things will improve but of course he does have to start eating or he will lose too much weight. I had this happen with 2 of my dogs and it’s tough. Prayers. Thank you for your reply. Duke is doing much better. As a matter of fact he is always hungry. He is on insulin so I don’t know if it has to be adjusted. He is not out of the woods yet, but acting like his old self. Glad to hear he’s doing better and has an appetite – always a good sign. Surely your vet has recommended you go back to check his dosage is correct? Yes, his dosage was checked 2 wks ago and we go for testing pancreas in 2 wks. (LAST TEST WAS ALL DAY…TESTED LEVELS EVERY 2 HOURS) THANK YOU FOR REPLY. Our little Chewbacca went to the ER Hospital for blood work and x-rays. He vomited the previous day but nothing since. He would not eat and only drank a little water. The Pet ER gave an anti-nausea injection and sent us home with meds for pain and something to help with stomach bloat. Pancreatic enzyme was 5800 (normal is around 1000). Our regular vet called this morning and had me bring him in. She advised an ultrasound to see if there was an infection, tumor or blocked duct. He is lethargic, wont eat or drink and struggles to lay down or walk. Chewy is 16 years old and was in perfect health until 2 days ago. The night before he started vomiting we were given a corticosteroid topical spray for his underside rash. We will know the ultrasound results today and then need to make some decisions. One article by VCA Pet hospitals suggest that corticosteroids can trigger pancreatitis. It is so incredibly hard to see our most loyal and loving “buddy” so sick and in pain. Oh my goodness I had never heard that corticosteroids could trigger pancreatitis, I’m so terribly sorry to hear what’s happening with Chewbacca. Hopefully no food and fluids will help calm things down, and you’ll get some more answers from the ultrasound. Please keep us posted. Thank you for your compassion. Chewy is now home and happy to be with his humans. After 3 days of fluids and loving care by our long time Vet we are wiser about what we feed him. The ultrasound showed no critical issues so the culprit appears to be what we were allowing him to eat. Older dogs do not do well with high fat foods. Our Vet told us in a nice way that we may have been killing out little dog with kindness. So now he gets boiled chicken, baby food (Chicken & Broth) no fat cottage cheese, white boiled rice and a very expensive dog food ($5.00/can). Each day we have with Chewbacca is a gift. Good luck to everyone else who loves and is loved by our 4 legged friends. That’s wonderful to hear. It’s incredible how much fluids can help, and you’re so fortunate her pancreatitis was caught in enough time for the fluids to help her. We do have to be so careful with the fat in our dog’s food. The good thing is, adding those other ingredients means you can make each can go further. Hope Chewy continues to thrive on his new diet and thanks for keeping me updated. I just had my 12 year old Border collie treated for pancreatitus, first at my vet($800.00. )then at the emergency hospital which was $2600.00.She is home now and doing ok i think, to early to tell, but all in all, this will have cost over $3500.00 for three days of treatment. I cannot imagine what people do who do not have the money, i considered putting her down but i just couldnt do it, but at her age(nearly 13) im afraid this is just going to happen again. Every dog Ive had that has died at old age has racked up a huge vet bill then died anyway…i keep saying never again but then it just keeps on happening. I wish vets would just tell you the dog is to old and its kinder to put them down.But they just keep on recommending expensive treatments. I have to say I’m quite concerned by the amount of money it cost. My dog had chronic pancreatitis and I’ve never seen bills of that amount. I understand an emergency hospital is expensive, but that’s outrageous. Thanks for sharing all the insights and I am sorry to hear about your dog, Bailey. My most dearest Kaya was put down recently so I know the trauma and heartache that comes with the passing and loss of a close friend. Thank you, and I’m so sorry to hear about the loss of Kaya. I know how heartbreaking losing a much loved companion can be. I have a 15 year old dashsund she recently got extremely sick so we went to the vet on Saturday morning and she was diagnosed with pancreatitis and plus her back has been given her a fit. Now the next two weeks she is on medication and a special diet and we have to watch her closely. I could not hold the tears back. She seem so pitiful and with her age we’re not sure what will happen. She has been in our family for 15 years. Hoping for a good outcome. I’m so sorry to hear that. I hope the fluids and a new diet will help her recover. It’s tough to see them sick and feeling helpless to do anything. Keep me posted and hope she’s feeling better soon.